In 1974, the Society of Biblical Literature launched Semeia, an experimental journal devoted to the exploration of new and emergent areas and methods of biblical studies. A year later, an associated book series debuted with the publication of Robert C. Tannehill’s The Sword of His Mouth: Forceful and Imaginative Language in Synoptic Sayings. The first nine volumes of this new series were published by Fortress Press under the name Semeia Supplements. Beginning in 1982 with volume 10, Fortress and Scholars Press copublished the series, whose name was changed to Semeia Studies. 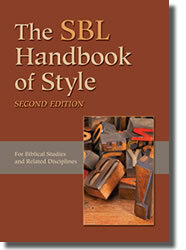 When Semeia the journal ceased publication in 2002, the book series Semeia Studies did not, as the Society of Biblical Literature (now the sole publisher) directed resources formerly devoted to the journal into expanding the book series. Following in the footsteps of the journal, SBL Press’s Semeia Studies continues to publish monographs and collections of essays that represent the best of interdisciplinary biblical studies. Brenner, Athalya. “The Food of Love: Gendered Food and Food Imagery in the Song Songs.” Semeia 86 (2001): 101–12. Brenner, Athalya, and Jan Willem van Henten, eds. Food and Drink in the Biblical Worlds. Semeia 86 (1999). Autero, Esa. “Ghosts, Women, and Evangelism (A Dialogue between Bolivia and Indonesia).” Pages 267–89 in Bible and Transformation: The Promise of Intercultural Bible Reading. Edited by Hans de Wit and Janet Dyk. SemeiaSt 81. Atlanta: SBL Press, 2015. Wit, Hans de, and Janet Dyk, eds. Bible and Transformation: The Promise of Intercultural Bible Reading. SemeiaSt 81. Atlanta: SBL Press, 2015.